GENOME II is the 2nd generation of the novel ATX PC case series from Deepcool, featuring an integrated extreme liquid cooling system with breathing light pump, cool-looking helix reservoir, and a massive radiator unit. GENOME II has retained essential features of the GENOME series, including: tool-free assembly, large side window, and mounting options for PC components. GENOME II also comes with a selection of improvements that offer greater configuration flexibility and ease of use to provide owners with ultimate satisfaction when completing their ultimate build. The featured Captain pump comes with 3 colors for the helix and is furnished with a white LED light that breathes life into the system. The cylindrical reservoir is upgraded with a double-helix provided within the front panel, providing PC gamers with awesome cooling as well as a fantastic visual feature and brilliant lighting element. The pre-installed extreme liquid cooling system includes a 360-mm radiator and 3 patented PWM-capable fans with double-layer fan blades, providing PC builders with the great cooling performance they need. 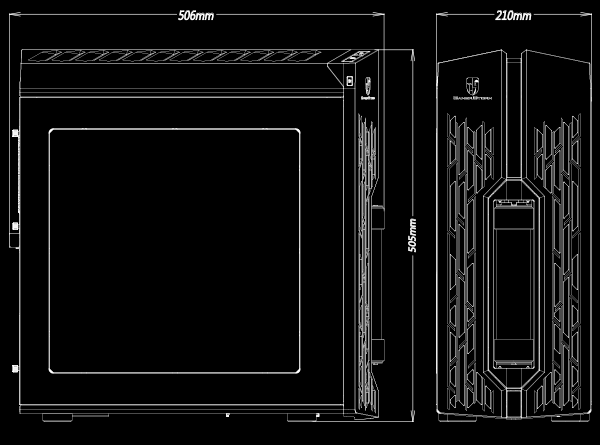 Extreme liquid cooling system embedded within the ATX case provides an integrative PC building experience. 100% visibility side window perfectly reveals system interiors and hardware components. Spacious configuration and rationalized port and hole layout enhance cable management. 1. You can now show off your prized GPU by mounting it vertically with the PCI-E extension cable (included with product) - easy to install and provides great stability and durability. 2. Additional radiators or fans can now be easily added to the front panel by removing the detachable HDD cage to free up extra mounting space. 3. Widened openings provided by the angled panel design provides GENOME II with better motherboard compatibility. 4. New cable routing and opening configurations now allows ultimate simplification of cable management, allowing you to achieve a neat system presentation. 5. Revolutionary 100% metal clip for most CPU sockets to achieve tool-free component mounting. 6. Floor-mounted PSU design for effective cooling and easy installation. Note: The complimentary PCI-E extension cable is only needed for vertical GPU mounting, but is not mandatory for the system.